Q: What does your company do? 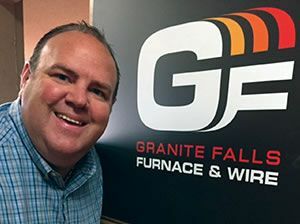 A: Please don’t let the name fool you...Granite Falls Furnace produces drawn steel wire covering a vast range from low carbon, high carbon, and music grades, to black and bright annealed wire for a wide range of industries. Q: What is your role there? A: I serve as vice president of sales and operations. Therefore I work with and for everyone; customers, suppliers, and our employees thus over-seeing our strategic direction and growth. Q: What do you like best about your position? A: I love the fact that I get to work with the many different levels/roles within our customer and supply base. In my position, I get to drive the culture within our business, where I personally know each of our employees. Q: How has your industry most changed? A: It seems to me, for the most part our industry has remained constant, with the same major producers, suppliers and customer base. GFF hopes to offer the suppliers and customers something new. Q: How does your company remain competitive? A: GFF is a family owned and operated business; therefore we operate with a very lean management structure that lends itself to very quick decisions and low overhead costs.